Fashion Art And Models: The Brynner! 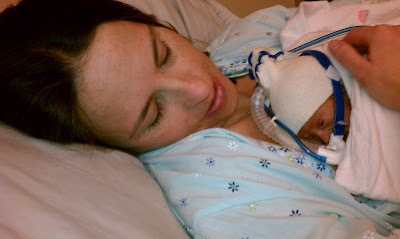 For those of you following Brynner the Winner (Kara's nickname), here are a few photos and updates from the past week. 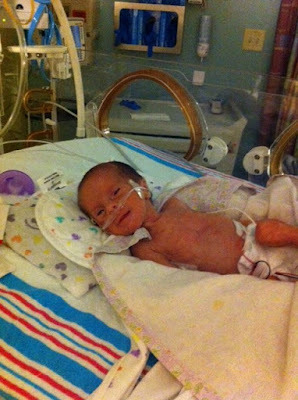 When Bryn entered the world she was 2 lbs, 15 oz and 14.5 inches long. She certainly does look like Brynner the Winner in this photo! She's even smiling!For anyone that knows Kara and Josh it comes as no surprise that their daughter is a fighter and has a mind of her own! On Tuesday Bryn was transferred to the Children's Hospital in Denver. While challenging for Kara and Josh since it is an hour from their home, they report feeling really good about the level of care she is receiving at the hospital in Denver. There are a lot of questions on the table about Bryn's health and she has been through a lot of tests over the past 48 hours to rule out and info gather on a lot of things. An Echo Cardiogram came back showing that Bryn's little heart if fully developed, so that is very good news. Kara and Josh are doing well considering and are working hard to keep Avery's schedule as normal as possible. Melissa is heading out there for 10 days and will be followed by Josh's mom and Mammo. Between family and their awesome friends out in CO they are all in good hands. Kara has been excited about getting some time to hold Bryn.